Many programs at the university encourage students to pursue an internship instead of taking a particular three-credit course during their senior year. Students are often told that internships are the best practical learning experience available. Many programs at the university encourage students to pursue an internship instead of taking a particular three-credit course during their senior year. “After seven semesters of regular classes, I was excited about the opportunity to change things up and explore the field that I’ve been learning about during college,” senior English major Allison Hochman said. Many students choose the internship option over a heavy course-load, their interest fostered by the university’s numerous career fairs and internship panels before and during the semester. Many majors, including English, require students to take a senior capstone, with the option to either enroll in a specific class or find an internship that meets the criteria. Paige Dana, an English major, took a capstone class during the first semester of her senior year. Dana found herself craving an experience beyond what the class offered and therefore decided to find an internship for credit the next semester. Some majors do not accept internships, and students must take the actual capstone course for credit. Catherine Cirella, a senior marketing major, is taking two capstone classes right now, one for business administration and another for marketing. Alia Zukerman, a senior business management and marketing double major, is taking a business administration capstone course in which students participate in an online marketing simulation. Is Honors the right fit for me? 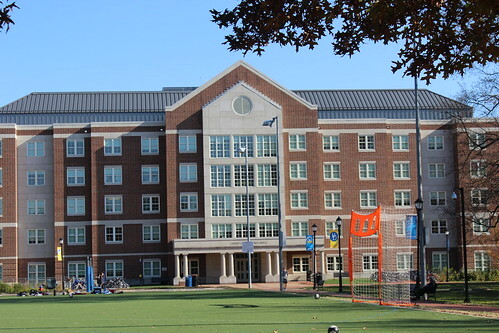 Is living on the luxury East Campus worth the added workload?